As we anticipate getting pregnant with number two, I’ve been thinking about my labor and delivery choices. For my first birth, I gave birth in a hospital without drugs with an OB attending the birth (ahem…catching the baby). For my second birth, I intend to give birth without drugs again, but I hope to go to a birth center this time around and use a midwife. I won’t try to hem and haw around the topic. Labor was the most intense and horrific pain I have ever encountered and pushing was even worse. But then, wonder of wonders, miracle of miracles – a little life emerged and overshadowed my life with love. I was enchanted by her sweetness – her long lashes, her soft skin, her button nose, and her tiny fingers and toes. Then, the pain seemed inconsequential. I immediately had a sense of euphoria and I knew that I would do it all again for that precious bundle that lay snuggled in my arms. Some people might ask (and sometimes I ask myself), “Why would you go through all of that pain when you can get instant relief with the push of a needle?” The answer is simple and also very complex. Part of it is the control that I would give up if I had the drugs. Instead of being aware of my body, I would have to succumb to the beck and call of the drugs. Part of it is that I don’t want the vulnerable little one inside of me to be exposed to drugs – if I can help it. Part of it is that I like the “quick recovery” aspect of natural labor. And, finally, there was something empowering and beautiful about just letting nature take its course – “giving in” and watching my body work. “…Fifteen minutes later, I was in transition and felt the urge to push. And, boy, did I feel the urge to push. You hear about it from other women and read about it on websites with birth stories. But the written word can’t really do justice to the sensation. It is beyond your control. Your body is working so hard. And in between screaming, you try to breath, you try to keep from passing out. …Then, the doctor appeared. Along with a whole cast of women in scrubs. Calm, she put on her gloves…The doctor counted with me at my lead, when the contractions appeared, 1, 2, 3…(scream). The baby’s head came out and then went back in, out and in, out and in…and then, in one miraculous moment that I will never forget, she slid out. And there she was, beautiful – the most beautiful thing I’d ever seen in all my life. Bloodied and crying, but oh-so-precious and small and perfect. I smiled at Tim, “I did it.” “You did it,” he said. We smiled. As the doctor delivered the placenta and then stitched up my second (almost third) degree tear, I couldn’t take my eyes off of my little beauty. She was even prettier than I had imagined – and so delicate and small and lovable. That was my choice. And I do realize that pain during labor (the length, the intensity, the management of it) is a very personal choice and I certainly wouldn’t cast a stone at women who made a different choice. But, as women, I do think it helps to share stories and recount the pros and cons of various techniques. Thus, I share my story. Over the next few months, I’ll be interviewing moms and founders of various pain management methods (Lamaze, Bradley, and beyond) to give you “inside information” about what works and what doesn’t. While we’re on the topic, what did you choose and were you satisfied with your birth experience? (Pictured…me (moments after delivery) – not my finest hour in terms of beauty, but perhaps one of my finest hours in other ways). I had stadol in an IV with my first two boys and wanted to go all natural for my third. I really found the book Having A Baby Naturally extremely helpful and did lots of good natural things during pregnancy to help during labor. (Raspberry Tea and raspberry tea leaf tablets work WONDERS!) I had Gray completely naturally with no drugs or interventions and he was the LEAST painful of my three labors and it was also the quickest and easiest. I will definitely do something similar next time, just hopefully at home instead of hospital. I also had a birth plan and was able to stick to it. I put at the bottom of my plan that I had the right to change my mind at any time- you just never know what is going to happen and if drugs would have helped me have the birth experience I needed, then I would have taken them. I am glad I was able to do it the way I did and have no regrets! I had no drugs with either of my little girls. I think it needs to be a personal decision (I was really put off by the moms who made me feel like I’d be a terrible mother if I chose to use pain medication during labor and delivery), but I’m glad I was able to deliver my sweethearts without the help of drugs. The pain was awful with transition and pushing, but it was soon forgotten once I saw what that pain (and nine months of uncomfortable ginormity) produced. I was awake and aware the whole time, my girls nursed right after birth, and I couldn’t have asked for an easier recovery, especially with the second. I did ask for IV meds with my second when it got really bad, but my husband knew I didn’t really want them, and thankfully it was too late anyway; she was born twenty minutes later. I was completely satisfied with my decision, but I think that satisfaction is no better than that of a mother who used medication to have her best birth experience possible. Healthy babies are what’s important! I had an epidural for both my deliveries. With my firstborn I found out that I reacted very strongly to the drugs. I had absolutely no feeling to push and it was horrible to have the nurse have to tell me when I was having a contraction. I was way over medicated. I also had an epidural for my second child but I discussed with my doctor what happened the first time and so while I did have an epidural I was not over-medicated so that I could feel to push the second time around. Overall, I’m glad I had an epidural. My birth story with Danae was not what I had envisioned prior to labor, but it’s still her birth story! :) After being admitted to the hospital at 100% effaced, almost 5 centimeters dilated, and laboring for 8 hours, the contractions slowed and stopped. So, my midwife in the hospital broke my water, and within minutes the pain was crazy intense. I opted for IV drugs, with was horrible. I had such a bad reaction (falling asleep between contractions that were 2 minutes apart, couldn’t open my eyes at all) that I’ve vowed to never do that again. My husband knew I didn’t want an epidural, so even though I was asking for one in my drug-induced stupor, he told them to hold off. At 8 centimeters dilated, the midwife said that I needed the epidural. Within minutes after receiving it, I was back to a normal person, talking and laughing (with my eyes open!). My daughter arrived about 3-4 hours after that. I chose to not use any pain meds, but I think even if I wanted to, I would not have enough time to actually get any medication. My labors are really really fast. They get faster each time. I barely made it to the hospital with my last two. If I ever get pregnant again, I will probably end up having the baby alone or in the car on my way to the hospital, or at the grocery store. I seriously have no warning. I’m fine 1 minute and then in full blown labor the next. Thankfully I went into labor each time while my husband was home. If I went into labor any other time I would most likely have the baby at home by myself. I ended up getting an epidural with Hannah. My labor was induced – the doctor broke my water and started me on pitocin at the same time (OUCH!). I went from feeling absolutely nothing (because I was not contracting) to being in the most horrendous pain within five minutes. Three hours later, I needed relief. Within 30 minutes of getting the epidural, I began to feel TONS of pressure. I pushed out Hannah in 19 minutes. 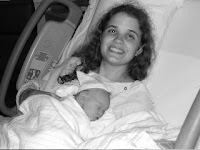 With Jacob, I went into labor naturally and didn’t even go to the hospital until I was 5 cm. But when my labor failed to progress, they decided to, once again, break my water and start pitocin. Knowing how much it hurt before, I opted for pain relief before they even started me on anything. And it was wonderful. I was able to relax and be at total ease. Bridget was induced a week before she was due because I kept contracting on and off and was in and out of the hospital for observation. I was miserable. And with two other kids to take care of, I was done being pregnant. My midwife determined that 39 weeks was fine to deliver and that the baby was healthy. She broke my water at 2PM. When 10PM came around and I was not contracting, we decided I should get a dose of pitocin. I got it at 10:15, and then went from 3CM to delivering in 45 minutes. Bridget was born at 11PM. For me, personally, I can handle progressing naturally. It’s the pitocin that made it unbearable. Oh – I delivered Bridget naturally. No time for pain relief! I had an epidural and will do it again even though I could feel were it had been done for three months after my son was born. That minor discomfort was totally worth being able to laugh and talk durning the pushing phase between contractions. I know it hurt a little, but that isn’t what I remember about my birth experience. I think it was in part to the epidural making me more comfortable. Being a Labor and Delivery nurse, my experience was very different. I’ve seen so many births in my life that I opted for the epidural. Sometimes I feel like I’ve already been through natural labor with some of these women. Plus the midwives at our hospital were not very good (not the case at other hospitals/birthplaces, they are usually awesome) so the support to have a natural birth just wasn’t there at our hospital. I think if you’re going to go natural, get a midwife, that’s the only way to go. They are so helpful and so supportive! Anyway…back to my story. I delivered at the hosptial that I worked at so I got the premiere treatment. I got my favorite doctor, my favorite nurses, and the best anesthesiologist, and a massage the next morning!!! I was 2 days over and I was able to schedule my induction since I was already 4 cm. I came in, my doctor broke my water, I got an epidural, and 6 hours later I had my little E. I never even felt the pain of labor, I never felt the pain contractions. I was so relaxed, the room was peaceful. I was very aware of what was going on since I wasn’t consumed by pain. I was able to feel the tightness of contractions so I knew when I was having them, just not the pain. I even got to take a nap to give me some energy to push. I woke up from my nap feeling tons of pressure. I called my friend (my nurse) and it was time. I could feel when I was having contractions and I could feel where to push, it just wasn’t painful. Now don’t get me wrong, not all epidurals are like that. Some people have epidurals where they are so numb that their legs are like bricks and they can’t feel a thing. They don’t know where to push, they can’t feel anything, and they take twice as long to push. My epidural wasn’t like that at all. It was perfect. Not too much, not too little. I pushed for about 45 minutes and I had a 8 lb 13 oz baby in the end. When it was all done, he ate right away, I wasn’t super tired since I got a nap, and I was up walking that night. I think my labor was so good because I was very relaxed. I was at my home away from home, I knew everyone, and there were no surprises. I knew what to expect, what my options were, and how things were done. I think that made all the difference. I also knew that if something were to ever go wrong, that it would be my greatest friends helping me and my baby. What a relief that was! So that’s my story. I’m not super opinionated about natural vs epidural. They are both good things. I think it’s based upon what the mom feels is right for her. In the end we all just want a beautiful, healthy child and that can be achieved either way. Wow! Your story had me laughing and nodding… and wincing. ;0) I was in labor with my daughter Meesha for 20 hours. The pain really wasn’t all that bad up until hour 18. I always thought I would opt for an epidural but decided that I would only do it if the pain became too much to bear. I ended up without one. I was overcome with how much pain my body was in but the doctor said that I was shaking too much to have one. (But I couldn’t stop shaking because of that pain… go figure?!?!) It made the first hour or so of Meesha’s life completely un-enjoyable for me. I could not connect like I had hoped to and I didn’t experience that wonderful ending to the story like you and so many other mothers. I wish I had. Because of this I have wondered what I would do at my next delivery. I see many benefits for my baby without any drugs… but then I remember the pain and the lack of bonding because of it and I just haven’t made up my mind. Thanks for the discussion!